Are you ready? Your life is about to change. 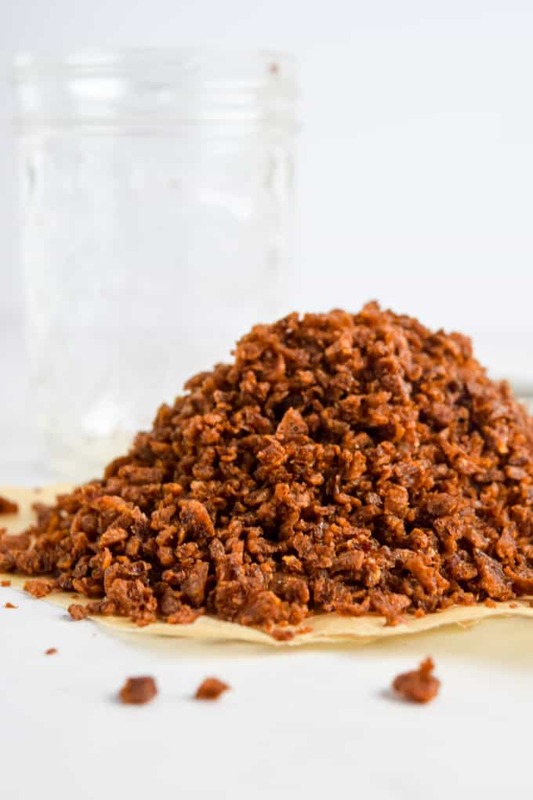 If you’re not familiar with Textured Vegetable Protein, allow me to introduce you. It’s a highly nutritious soy product loaded with protein; contains no fat; and, is the perfect alternative to meat. 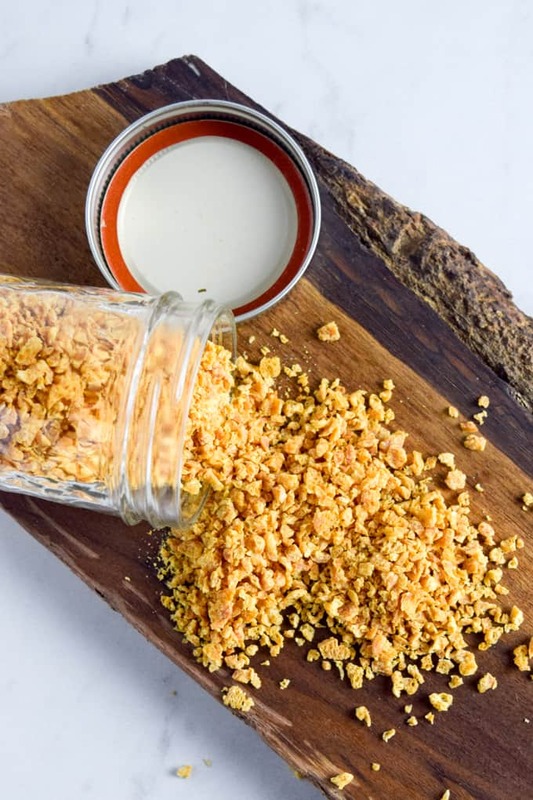 TVP is nothing more than defatted, dehydrated soy flour and it’s naturally gluten-free. Personally, I think it’s pretty close to perfect. Why? Because of what I just said: low in fat and calories, contains a ton of protein and a great source of fiber. Awesome, it’ll keep you strong and regular. How ’bout that? However, it’s pretty flavorless so if you want to enjoy it you’ll need to be creative. 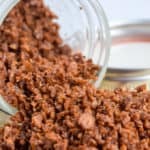 I decided to see what would happen if I used my “bacon” brine from my Smoky Maple Tempeh Bacon. The results? Honestly, there are no words. 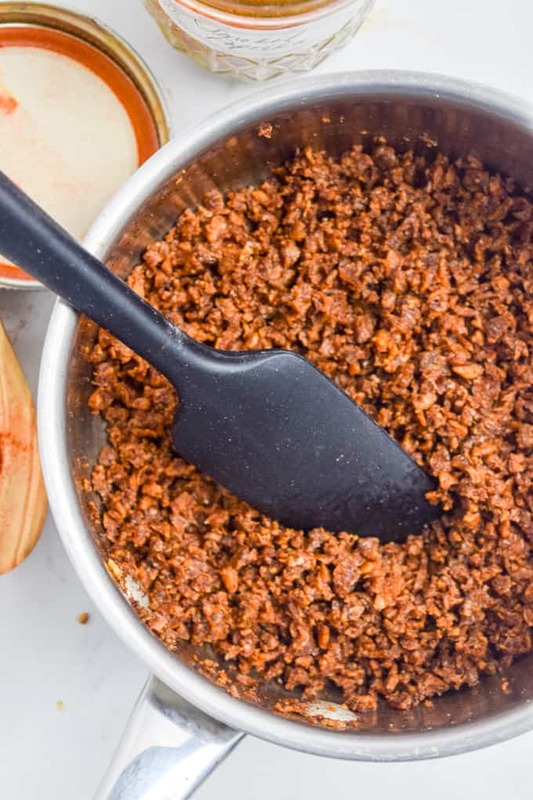 This recipe is so simple, all you need are 6 or 7 ingredients and roughly 10 minutes of your time. It really is that easy. If you can boil something, you can do this. 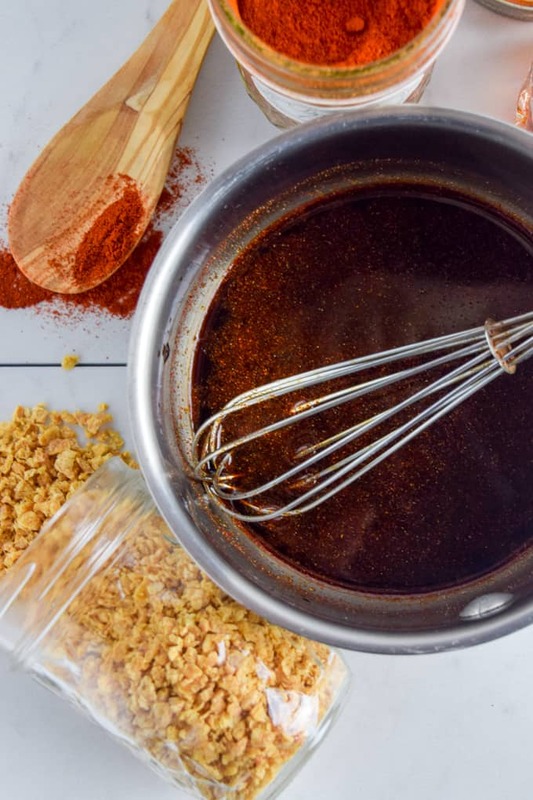 The delicious mixture of spices, maple syrup, liquid smoke, and soy sauce create the ultimate savory, sweet, spicy flavor. Once you bring it all to boil, you simply throw in the TVP and let it soak. 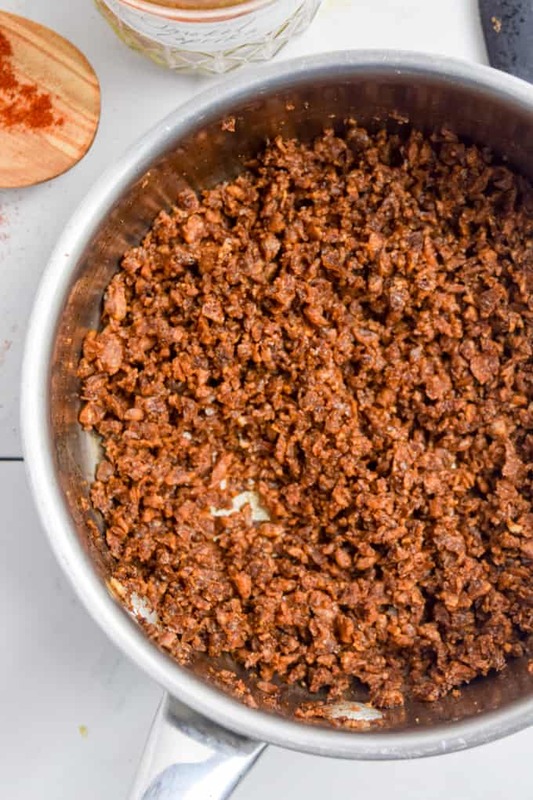 You can add one final step by baking these low and slow at 225 degrees until they reach your preferred level of crunchiness. Just check on them every few minutes and give the pan a little shake so you don’t burn them. If you’ve been longing for something to satisfy a craving from your past, look no further. The smell, the taste, the texture – it’s all there. Everything except the flesh of a dead carcass someone needlessly killed and all the chronic diseases that go with it. Perfect for topping for your salads, baked potatoes with my Cashew Sour Cream or just eat it by the handful. 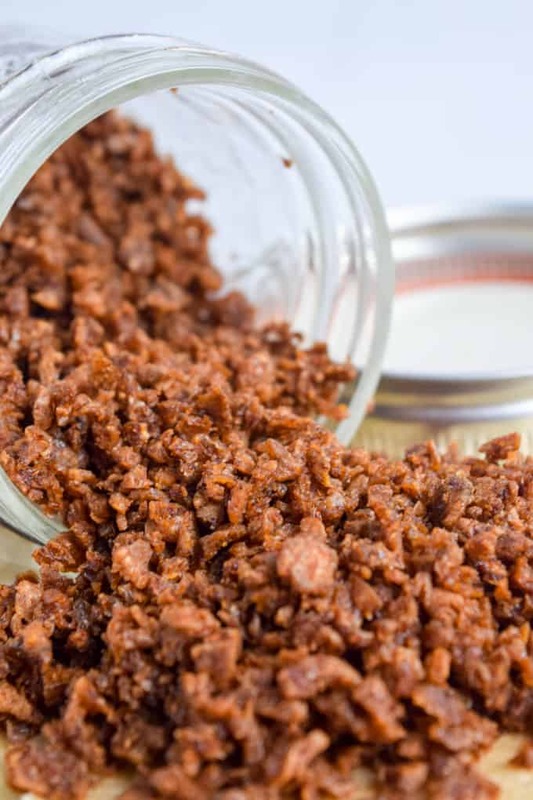 Savory, smoky, crispy and delicious bacon bits made from TVP. These are the perfect topping for salads, baked potatoes with my Cashew Sour Cream, or simply eat by the handful. Place all ingredients, EXCEPT FOR TVP, in a small sauce pan and bring to a boil. Once the mixture starts to boil, remove from heat and add TVP. Stir until all the liquid has been absorbed. Pre-heat oven to 225 degrees Fahrenheit and line a baking sheet with parchment paper. 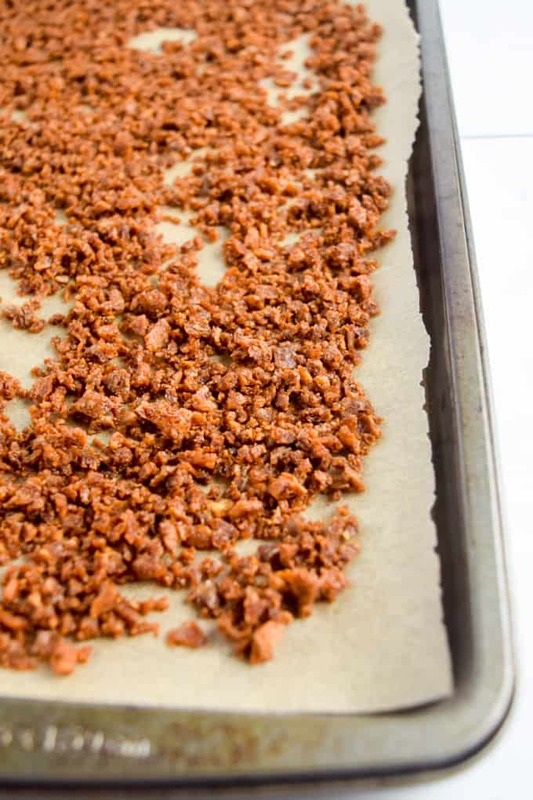 Spread bacon bits out evenly on baking sheet and place in oven. Cook for just a couple minutes then shake so the bacon bits will cook evenly. Repeat until the bacon bits are crispy, but be careful not to burn. *Baking is not necessary, it just depends on how crunchy you want them. Fantastic! I baked them longer for a nice crunch and added 1 TBSP of nooch and 1 TBSP oil. 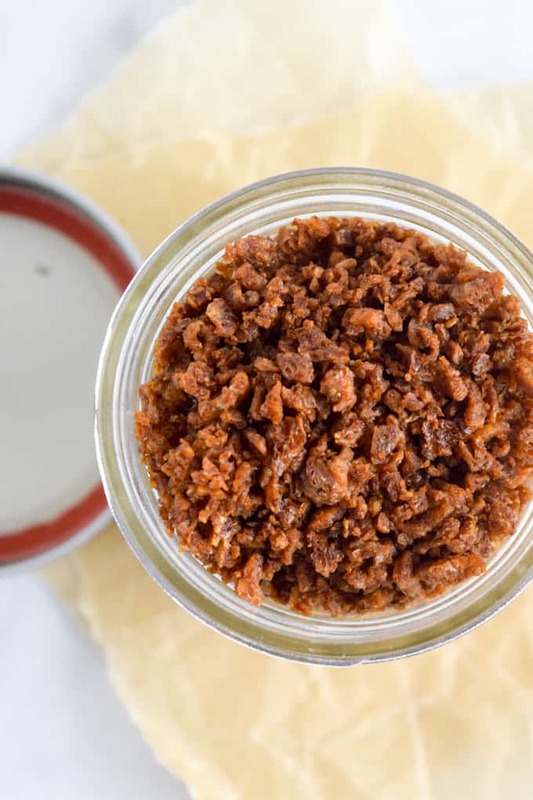 This recipe makes me want to make a ton, jar it up with pretty labels and gift them! Thanks for the recipe – it was TOTALLY AWESOME! I didn’t have liquid smoke, but added a ½ tsp ‘smokey’ BBQ sauce and a ½ tsp of Marmite and they were delicious!! Great idea! Never thought of that. Can’t wait to try myself. Pre-heat oven to 225 F or C? Super easy to make. Quadrupled the recipe to make bacony bits for Brussels sprouts for my omni partner’s family for thanksgiving. I’ve just made these but didn’t bake them till crispy, because I want them to be a bit chewy. They’re awesome and so easy to make! I’m planning to add them to some ‘cheesy bacon’ stuffed potatoes but I’ll make crispy ones for salads next time. Thanks for the recipe! Amanda, that’s awesome and love your idea with the potatoes. Thanks so much for reaching out and sharing! Blessings. This recipe looks amazing! Do they have to be refrigerated after baking?